Towards the end of last year I started using a new piece of equipment for which the design is actually 100+ years old. It’s called a Ghillie Kettle and it does the same things a Jet Boil, two-burner, or whisperlite does–namely boil water, but without the need to carry any fuel with you. The name and origins date back to the Ghillies of Western Ireland who would heat water riverside for their clients’ tea. The idea is that all you need to heat water are pine cones, twigs & small sticks, dried grass or any other combustibles that might be lying around. It’s basically a double-walled boiler with a chimney through the middle of it and is extremely easy to use. That’s not to say it doesn’t take some getting used to, but once you do it’s easy to set up and boils water pretty quickly. I wondered if I would actually ditch my jet boil to find twigs and start a fire, and I must say that while it’s not as fast there’s something very romantic and soothing about starting a fire to boil water. I’m pretty sure my Ghillie is going to find a home in my family camping/overnight boat box, as I like idea of starting a little fire and not having to worry about fuel for those situations where I might forget it or it’s hard to find. My Ghillie also came with a small attachment that is called a “cook kit,” and while I’ve yet to use it, the idea is that you can cook or heat up food over the chimney while boiling water. 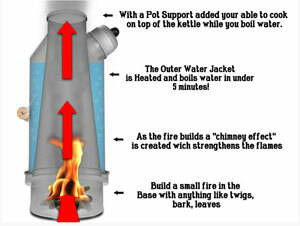 So for you folks that like the idea of being able to boil water without relying on any fuel, go on super-extended outings where loads of fuel is an issue to carry, or just like the smell of wood smoke, the Ghillie Kettle might be for you. It’s fit and finish are impeccable, and it comes in a number of sizes. When we break out of the deep freeze here I plan on using mine some more and will try the cooking attachment. When I do I’ll report back and let you know how it works and if I’ve come across anything more I like or dislike about the kettle.